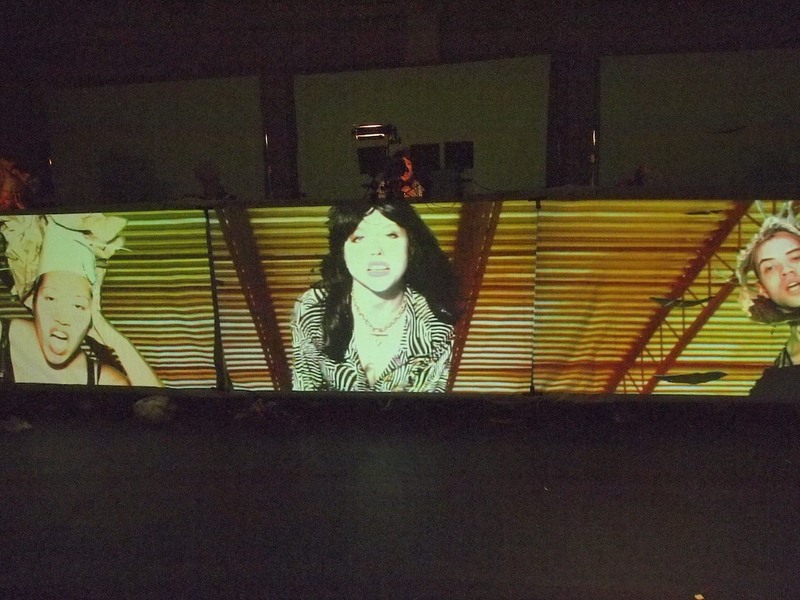 ENTANGLED: Technology And The Transformation Of Performance explores technology’s influence on artistic performance practices in the twentieth and twenty-first centuries. In Entangled, Chris Salter shows that technologies, from the mechanical to the computational—from a “ballet of objects and lights” staged by Diaghilev’s Ballets Russes in 1917 to contemporary technologically enabled “responsive environments”—have been entangled with performance across a wide range of disciplines. Salter examines the rich and extensive history of performance experimentation in theater, music, dance, the visual and media arts, architecture, and other fields; explores the political, social, and economic context for the adoption of technological practices in art; and shows that these practices have a set of common histories despite their disciplinary borders. Culturebot says “This is the theater of the future”. Ticket, press, video and sound below…. Hope to see you there. Caden Manson: I’m proud of the company, and how it’s grown and the talent of everyone that’s been in it, and how they all have grown in those ten years, too. Also where we’ve been and the audiences we’ve reached, because I think it’s a unique opportunity to be able to have played the places that we’ve played in Europe and in the United States on both coasts, because the audiences are different in each place. 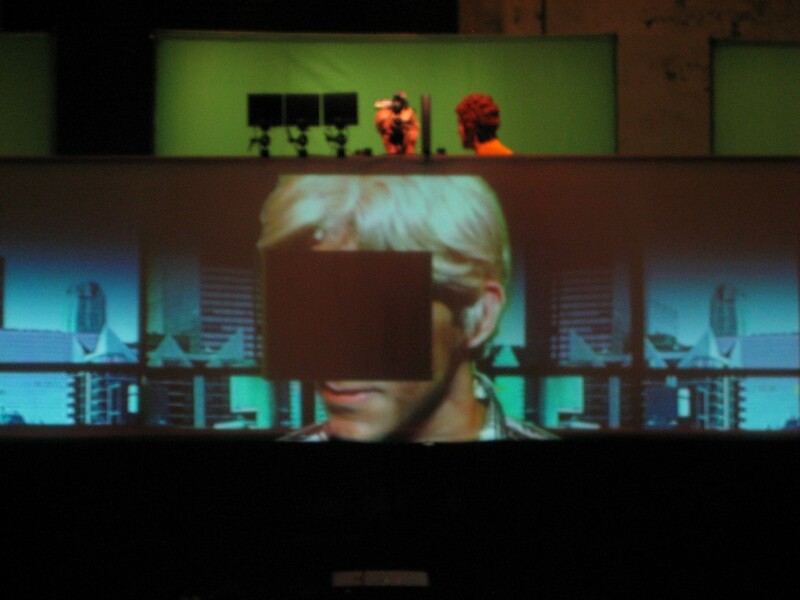 Nelson: The idea of the weekend at Abrons Arts Center is that it’s past, present, and future. You can come see these video installations that represent past work, “SOS Animals” and “The Imitation.” And then there’s the present, which is “The Sleep,” which is the musical collaboration that we’ve been working on with Theo Kogan and Sean Pierce. And there’s the future in “Flesh Tone,” which is our new group work, which is still in development. Big Art has releases a short video montage of our works with commentary by Under The Radar Festival’s Mark Russell and The Kitchen’s Matthew Lyons. Click below to listen to the newest track “Bronze”. Music is by Theo Kogan, Sean Pierce and Jemma Nelson. http://secureservercdn.net/198.71.233.204/9d3.d38.myftpupload.com//wp-content/uploads/2013/07/bignontranslogo3.png 0 0 Big Art Group http://secureservercdn.net/198.71.233.204/9d3.d38.myftpupload.com//wp-content/uploads/2013/07/bignontranslogo3.png Big Art Group2010-04-17 09:30:002010-04-20 11:10:27Culturebot says "This is the theater of the future". Hello, Tomorrow is the big celebration of our 10th Anniversary. Below are links to buy tickets, pre-press, video, and music streams. With our upcoming 10th anniversary weekend TAKE OVER at Abrons Art Center (NYC) happening in less than a week, Big Art has releases a short video montage of our works with commentary by Under The Radar Festival’s Mark Russell and The Kitchen’s Matthew Lyons. Recently Big Art Group sat down with Justin Bond to talk about the 10 years of Big Art Group. Rail: I was at your very first casting call, and have seen your process: cultivating actors, and training them and getting them into the mindset and the physical exertion that it takes for the complexity of the choreography of your pieces. The first one we did, which was “CLEARCUT, catastrophe!,” had a certain amount of choreography, but it really jumped from there to the next piece, which was “Shelf Life.” With the amount of choreography and the complexity of what you had your actors do, there was probably a huge learning curve for you. But now, bringing the new actors in, I would imagine that it’s exciting for them. 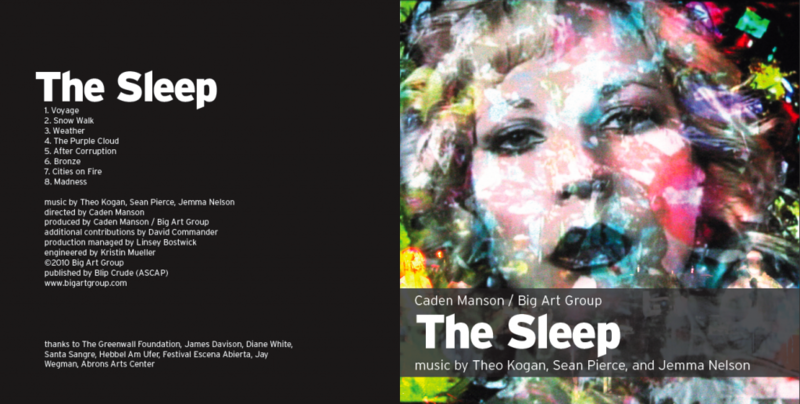 Big Art Group’s 10th Anniversary TAKE OVER at Abrons Art Center is 2 weeks away (April 15-18, 2010) and we are releasing The Sleep album online! Click below to listen to the newest track “Bronze”. Music is by Theo Kogan, Sean Pierce and Jemma Nelson. Buy the full album here. Tickets on sale now for The Sleep and Flesh Tone – Part of the Big Art Group TAKE OVER at Abrons Art Center April 15-18, 2010. The Sleep mixes early cinema techniques, magic lantern, concept album and Big Art Group’s Real Time Film technique into a live see-though movie adapted from M. P. Shiel’s 1901 story, “The Purple Cloud,” in which a lone explorer races to the North Pole while a poison purple cloud covers the earth. His subsequent return to the remnants of civilization drives him into a crisis of being, in a classic “last man” adventure that eerily presages catastrophic climate change. Live music by Theo Kogan, Sean Pierce, and Jemma Nelson. Supported by the Greenwall Foundation. Big Art Group’s new project Flesh Tone is told through hybrid, hallucinatory storytelling influenced by steely Hollywood thrillers and filtered though the company’s breathtaking mediated performance techniques, Real Time Film and Green Screen Performance. A character-driven critique of the American way of looking at the world, Flesh Tone turns the visual economy of the US into an acid bath of self-exposure. Confronting social issues of economic and environmental degradation, a war-scarred national psyche, and transformed bodies, Flesh Tone queries Image-America about a possible path to reconciliation with its own monstrous reflection This live performance spans cinema, visual art, and spectacle in an utterly unique, compelling event.